Double, double toil and trouble; Fire burn, and cauldron bubble -- maybe Macbeth should have consulted the Witch Head Nebula. The suggestively shaped reflection nebula is associated with the bright star Rigel in the constellation Orion. Described as a "dusty curtain" or "ghostly apparition", mysterious reflection nebula VdB 152 really is very faint. Far from your neighborhood on this Halloween Night, the cosmic phantom is nearly 1,400 light-years away. Also catalogued as Ced 201, it lies along the northern Milky Way in the royal constellation Cepheus. Is this what will become of our Sun? Quite possibly. The bubble of expanding gas pictured above is the planetary nebula PK 164 +31.1, the remnants of the atmosphere of a Sun-like star expelled as its supply of fusion-able core hydrogen became depleted. Oh what a tangled web a planetary nebula can weave. The Red Spider Planetary Nebula shows the complex structure that can result when a normal star ejects its outer gases and becomes a white dwarf star. Beautiful emission nebula NGC 6164 was created by a rare, hot, luminous O-type star, some 40 times as massive as the Sun. Seen at the center of the cosmic cloud, the star is a mere 3 to 4 million years old. Braided, serpentine filaments of glowing gas suggest this nebula's popular name, The Medusa Nebula. Also known as Abell 21, this Medusa is an old planetary nebula some 1,500 light-years away in the constellation Gemini. Like its mythological namesake, the nebula is associated with a dramatic transformation. 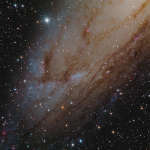 The large stellar association cataloged as NGC 206 is nestled within the dusty arms of neighboring spiral galaxy Andromeda (M31), 2.5 million light-years distant. Seen near the center of this gorgeous close-up of the southwestern extent of Andromeda's disk, the bright, blue stars of NGC 206 indicate its youth. Normal cloud bottoms are flat. This is because moist warm air that rises and cools will condense into water droplets at a specific temperature, which usually corresponds to a very specific height. As water droplets grow, an opaque cloud forms.